None, I plan to keep the car bone stock. Born in Lake Charles Louisiana, graduated from Redemptorist High in 1978, hired with Dow Chemical in March of 1981, retired in September 2014. Thanx for addin me as a friend. I am in Gonzales, south of you in BR. Give me a call one day we can comapre notes. I have an 80 model and a new 2008 coupe. Yours is lookin bitchin , keep up the great work and pics. they are inspiring! I found her off of this site; just can't remember which thread. Hey, I read the thread about your car and the vette project is looking good. 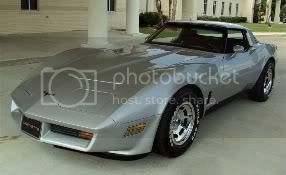 i just saw your last post i am glad that i am not the only one the eats, sleeps and .... (well you get the idea) the corvette. your project is coming along very nicely. I can not wait for spring to take my car out. Thanks for adding me. I love the '81 with the silver in and out. Pretty much stock except for the radio, the factory cass. worked perfect just had to change with the times. I also will do the bubble tail lenses that are in the mail. Motor is 100% original and has never been touched or anything played with. The only performance mod I may do in the future is the chip. Randy thanks for adding me as a friend. I also love the 81. I remember as a kid my uncle had a 75 i would drool over. i would always try to convince my dad to get one. Well it only took me around 30 years but i got mine. BTW mine also has a salvage title. Back in 81 the original owner decided to see if the car could fit under a truck. LOL. the damage was only to the fiberglass but the insurance company had it totaled. I am the 3rd owner. the car had been sold from one friend to another. the guy that sold me the car actually interviewed me before he sold me the car. anyway i would be glad to help you as much as i can with my limited knowledge of the car. Mine is pretty much stock with the exception of the rear diff and the suspension. The rest i plan to keep original. I can not wait to see the progress on your car.